With a big grin and seemingly endless supply of energy, Amanda Hughens, GCU’s K-12 STEM outreach manager, spreads STEM love throughout the region’s schools. You may know Amanda Hughens as Grand Canyon University’s K-12 STEM outreach manager, the force of energy who leads the mission to cultivate a passion for science, technology, engineering and math among children of all ages. But Hughens does much more than serve as educator, professional development specialist and advocate for STEM programs at GCU and K-12 schools. She is a redheaded blur of activity who wears more proverbial hats than a millinery’s model and whose resumé is rife with adventurous as well as academic accomplishments. President of the Arizona Science Teachers Association? Check. Earning an MBA from GCU while working full time? Check. Starting a foundation to help underserved children? Check. Wife, mother and Girl Scout troop leader? Check, check and check. “I have a problem with the word, ‘no,’ ’’ said Hughens, speaking from her office in GCU’s Academic Affairs Department, her signature grin spread across her face. That Hughens brims with technological know-how might be surprising to those knew her as a writer, search-and-rescue diver, 7th grade science teacher or volleyball, basketball and track coach. That she is on the cutting edge of STEM curriculum might prompt a quizzical look from her former fellow pre-med students and her hunting, hiking and fishing buddies. Hughens wears so many hats it can make your head spin, yet she does it with aplomb. Even Hughens herself might have been amazed, at the dawn of her passage, to learn where she would arrive one day. She was once certain she was heading full-steam ahead toward a medical career. “I kind of fell into the tech world,” Hughens said. Hughens grew up as one of four children and the daughter of a defense contractor. They moved often. Hughens spent her senior year at Agua Fria High School, where she received her diploma. When she enrolled in the University of Arizona’s pre-med program, she fully expected she would become a doctor. Her life veered in the summer of 1992. Because she had been a lifeguard for many years, the Rural/Metro fire service offered to finance her underwater search- and- rescue training. She became an emergency medical technician, and spent the summer looking for drowning and other victims. The grim experience taught her that medicine was not her calling, despite her aptitude for science and math. 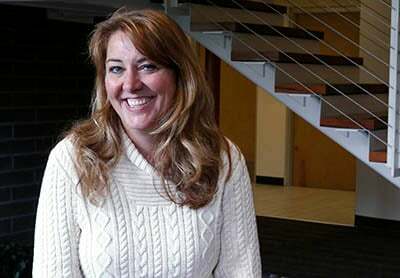 Hughens switched her major to education with an emphasis on science and transferred to Northern Arizona University, where she earned her bachelor’s degree in 1994. Her journey led her to develop an acumen for STEM education. In addition to teaching and writing stints, her resumé includes such positions as director of educational technology for the Litchfield Elementary School District and trainer/curriculum designer at the Arizona K-12 Center. In various roles, she has developed STEM curriculum for educators and students. One thing she has learned: If you want a job after college, consider studying science, technology, engineering and math. “The big thing about STEM is that the growth in careers is outpacing all the fields,” Hughens said. One of GCU President Brian Mueller’s primary goals is to attract students to the University’s rapidly expanding STEM programs and help meet a soaring demand in Arizona and around the country for employees in these fields. By 2020, the plan is for STEM students to comprise 70 percent of the University’s student body. To further than goal, GCU hired Hughens in May 2014 as its first K-12 STEM outreach manager, in the Strategic Educational Alliances (SEA) department. It was a reunion for Hughens and Tacy Ashby, SEA senior vice president. Hughens taught science for nearly six years in the Cave Creek Unified School District, where Ashby had been assistant superintendent. With her seemingly endless arsenal of energy, Hughens takes delight in spreading STEM love to Arizona middle and high school students and their teachers. She organizes events such as robotics contests, fairs, conferences and summer camps, such as, “Amp it Up: The Science & Engineering of Guitar,” where participants built their own guitars. She’s on to something: More than 100 principals, superintendents and curriculum leaders from public, private and charter schools attended a STEM Innovation Breakfast on Tuesday at GCU. The response was so overwhelming that Hughens moved the event to the Arena, and Mueller gave the opening talk.